Are you forgetful, especially when it comes to the important stuff that you need to remember? Are you one of those people who needs to write everything down and carry a list with you everywhere you go? Are you a student being required to remember complex formula or absorb volumes of information in preparation for an essay or exam, and don’t feel this is your one of your strengths? Some people have minds like “sieves” – a filter with many holes for straining water, but instead of water being strained and going through, it is information that the mind just can’t seem to retain. Can one learn to retain information and get it into their memory to use it at a later date? If so, is there a mechanism they can use to not only retain it, but to recall it as well? Hypnosis is one amazing method for retaining and recalling information. Hypnosis for information recall can be done either through the coaching of a therapist specializing in hypnosis, or using self-hypnosis in the form of CD’s. When being guided by a trained hypnotherapist, the results for memorizing information and then recalling it is rather fast and effective. In fact, you will notice results as fast as the first session. How does hypnosis work for memory and recall? First off, you can’t remember something that is not in your memory. In order to truly remember something, you must first perceive it and process it, meaning you take it all in. Hypnosis can help you become more attune to perceiving things by preparing your senses with a greater sense of awareness! Next, under hypnosis, a therapist can help you focus on important details of information and things while blocking things that are irrelevant. This is done by having post-hypnotic suggestions and cues placed into your unconscious mind so that when you are in a state of memorizing something, or focusing on something for later recognition or recall, your mind will shift to a state of tunnel vision or awareness – you only focus on what is important and choose to remember that! The next key that hypnosis will provide is recall and/or recognition to help you pull out the necessary information as required. Using post hypnotic suggestions or cues, you are taught to use “cues” to stimulate the mind and pull out of it what is needed when it is needed. A therapist can help by giving you a “trigger“. Say for example that you are writing a test and sometimes draw a blank. When you experience this blank, the cue might be to look at your watch and as you look at your watch, the unconscious mind is further cued to make available the information that you need then and there. Everyone uses their own means for remembering things. For those using this method, it is a short-cut to recall and it works effectively! 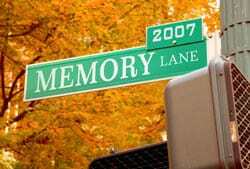 Begin today and watch your memory improve by checking out this MP3 session here.